Access to the work of others is something that is too often taken for granted, yet problematic and difficult to be obtained unless someone pays for it. Green and gold open access are claimed to be a solution to this problem. While open access is gaining momentum in some fields, there is a limited and seasoned knowledge about self-archiving in computer science. In particular, there is an inadequate understanding of author-based self-archiving awareness, practice, and inhibitors. 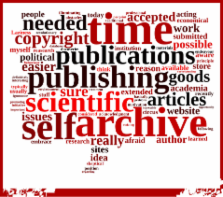 This article reports an exploratory study of the awareness of self-archiving, the practice of self-archiving, and the inhibitors of self-archiving among authors in an Italian computer science faculty. Forty-nine individuals among interns, PhD students, researchers, and professors were recruited in a questionnaire (response rate of 72.8%). The quantitative and qualitative responses suggested that there is still work needed in terms of advocating green open access to computer science authors who seldom self-archive and when they do, they often infringe the copyright transfer agreements (CTAs) of the publishers. In addition, tools from the open-source community are needed to facilitate author-based self-archiving, which should comprise of an automatic check of the CTAs. The study identified nine factors inhibiting the act of self-archiving among computer scientists. As a first step, this study proposes several propositions regarding author-based self-archiving in computer science that can be further investigated. Recommendations to foster self-archiving in computer science, based on the results, are provided. Background The Internet has recently made possible the free global availability of scientific journal articles. Open Access (OA) can occur either via OA scientific journals, or via authors posting manuscripts of articles published in subscription journals in open web repositories. So far there have been few systematic studies showing how big the extent of OA is, in particular studies covering all fields of science. Methodology/Principal Findings The proportion of peer reviewed scholarly journal articles, which are available openly in full text on the web, was studied using a random sample of 1837 titles and a web search engine. Of articles published in 2008, 8,5% were freely available at the publishers' sites. For an additional 11,9% free manuscript versions could be found using search engines, making the overall OA percentage 20,4%. Chemistry (13%) had the lowest overall share of OA, Earth Sciences (33%) the highest. In medicine, biochemistry and chemistry publishing in OA journals was more common. In all other fields author-posted manuscript copies dominated the picture. Conclusions/Significance The results show that OA already has a significant positive impact on the availability of the scientific journal literature and that there are big differences between scientific disciplines in the uptake. Due to the lack of awareness of OA-publishing among scientists in most fields outside physics, the results should be of general interest to all scholars. The results should also interest academic publishers, who need to take into account OA in their business strategies and copyright policies, as well as research funders, who like the NIH are starting to require OA availability of results from research projects they fund. The method and search tools developed also offer a good basis for more in-depth studies as well as longitudinal studies. I think it is worth mentioning here the related ScienceOpen author interview: http://blog.scienceopen.com/2014/07/scienceopen-author-interview-series-daniel-graziotin/ It provides more background regarding this study.